As Darlington kicks off its Alumni Weekend celebration today, the Alumni Office is pleased to announce that Wright Bagby ('63, LD '12) is the recipient of the 2018 Distinguished Alumnus Award. "Wright is not about Wright. Wright is about everyone else," said Bob Hortman ('72), chairman of the Board of Trustees. "He has volunteered and given of himself countless hours, day after day, year after year, for others – making this school, and his church, and this community a better place." Bagby is a lifelong resident of Floyd County and retired business owner who was elected to the Floyd County Commission in 2016. He served two previous terms on the Rome City Commission and is the former Mayor of Rome. As a Darlington student, Bagby was class treasurer; president of the D Club; vice president of the Jabberwokk; served on the staff of The Darlingtonian; and was a member of the Honor Council, Glee Club, and Dance Committee. He also played football, soccer and baseball. He went on to graduate from Auburn University. Bagby has contributed much to his community. As a County Commissioner, Bagby is chairman of the Floyd County Admin Finance Committee and serves on the Floyd County Public Safety Committee, Rome-Floyd Joint Development Oversight Committee, Rome-Floyd Joint Services Committee, Floyd County Board of Health, Floyd County Work Release Committee, Floyd County Judicial Services Committee, and Floyd Healthcare Management Board. He is also past president of the Boys & Girls Club of Northwest Georgia, a life deacon of First Baptist Church of Rome, a past chair of the Rome-Floyd Planning Commission and Rome-Floyd Parks & Recreation Authority, founding president of Rome-Seven Hills Rotary Club, former board member of South Rome Redevelopment, and a founding member of the Community Foundation for Greater Rome. 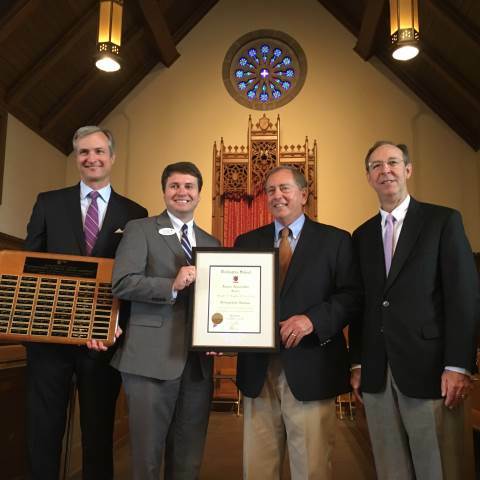 For his service, Bagby was recognized as a recipient of the Heart of the Community Foundation’s Heart of the Community Award of Honor as well as the Boy Scouts of Northwest Georgia’s Distinguished Citizen Award. At Darlington, he is a former class agent, a graduate of Leadership Darlington, and a longtime volunteer and past board member for The Darlington Fund. He is also a member of the J. Daniel Hanks (’27) Heritage Society. "You will be greatly prepared for life if you take advantage of what is offered here [at Darlington]," Bagby said to the student body after receiving his award. "This is a special place and I will forever be grateful to my parents for the sacrifices they made to give me the opportunity to be a student here ... In life, some get recognized and some don’t, but when you work as a team, you can accomplish great things. He and his wife, Pat, are the parents of Beth (Bagby) Smith (’87, LD ’12) and Tripp Bagby (’91). They have five grandchildren, Bailey Smith (’15), Avery Smith (’17), Anne Scott Smith (’20), Will Bagby (’22) and Chandler Bagby (’25).